Experience Hawaii in an exquisite beachfront mansion with panoramic ocean views on beautiful Waimanalo Beach (famous filming locale for Magnum P.I., Hawaii 5-0, & Lost). Waimanalo's small town doesn't allow hotels, making it the perfect getaway from the busy tourist spots, yet still close to so many great activities and attractions! The countryside of Waimanalo is slow moving and filled with Aloha, beauty, and authentic Hawaiian experiences. The Royal Hawaiian Estate offers a luxurious and relaxing open floor plan maximizing the breathtaking scenic views from floor to ceiling windows and doors which open up to the beautiful surroundings. The multiple levels of the estate provide 6 bedrooms boasting beautiful ocean views while the other 3 rooms overlook the spectacular Koolau Mountains. The entryway to the 3-bedroom guest wing at the top of the second floor creates options to suit your needs for community living or close it for a more private experience among guests. The guest wing becomes a completely separate 3 story home with its own private entrance, kitchen, dining room, and living room. While staying at this luxurious beach estate, your stay will be worry-free due to the level of attention that goes above and beyond expectations. In addition to the comfortable bedrooms, large indoor living spaces, and gourmet kitchen, the outdoor spaces offer flexibility for entertaining or relaxing as you desire. Embrace your own private fenced yard, stunning ocean-front views, direct beach entrance, large covered patios, outdoor bar, BBQ grill, large pool with a built-in slide and a lava rock waterfall, outdoor shower, and hot tub! At night the estate comes to life with blazing Tiki torches and custom landscape lighting. Enhance any gathering, indoor or out, with our whole house sound system including Pandora and Rhapsody. We offer concierge services and can arrange activities, transportation, massages, or private chefs to prepare customized menus for your group. Almost any imaginable water sport and Hawaiian experience are in proximity, including Sea Life Park where you can swim with the dolphins. Traveling along the coastal Kalanianaole Highway, and just minutes away, you'll find attractions such as Blowhole, Makapu'u Beach, Tide Pools, Sandy Beach, Makapu'u Lighthouse (for whale watching), multiple lookout points, Hanauma Bay for world-famous snorkeling, and Koko Marina (just to name a few). Don't forget about the unbelievable trails, such as Koko Crater and Manoa Falls, which make for a great adventure. Just 10 minutes either direction brings you shopping and famous restaurants such as Roy's in Hawaii Kai or eclectic, locally grown food from Cactus in Kailua. Adventure just 20-minutes to Honolulu, 30-minutes to Waikiki and Ala Moana Mall, 35-minutes to Pearl Harbor and 45-minutes to the North Shore for world-class surfing! This is truly a special location. Air conditioning and TVs in all 9 bedrooms and the entire guest wing. Cribs, playpens, high chairs, etc. Just let us know what you need! TVs in the kitchens, exercise room, and master bath. Control4 Home Automation to control lights, lock doors (key-less entry) or arm security. You can even control lights and sound with your own phone or iPad! Safety features including: removable fencing/gates for stairs/pool/balconies, safety turtle wristbands that sound a high decibel alarm when children come into contact with water, childrens' arm floats, state of the art security system that is simple to use including motion sensors, cameras, invisible beams, etc. $6,500 - $10,000 per night. 50% down to hold a reservation. Balance due 60 days before check-in. $5,000.00 security deposit. $2,850.00 cleaning fee. 4% processing fee. Listed rates do not include tax. Holiday and peak season rates and required length of stay may be different than quoted above. Credit cards, cash, checks and wire transfers accepted. Minimum night stay varies amongst the various rental units. Many rentals have 30-night minimums. Tax number: TA-106-722-5088-01. This is an exceptional property. It's very spacious and well-appointed and the view is spectacular. Loved the large lanai and the hot tub. We had 11 adults and 4 kids and there was room for everyone. Would highly recommend it! Rate everything a 5 it was more beautiful than expected. Perfect location with the local cultural around. Hospitality was amazing. Plenty of activities in your own back yard. thanks so much for a great stay! the new additions to the house were wonderful; the kids were on the waterslide all day long, while the adults spent a lot of time on the new patio furniture. the place was just perfect for our family of 23. thanks again! 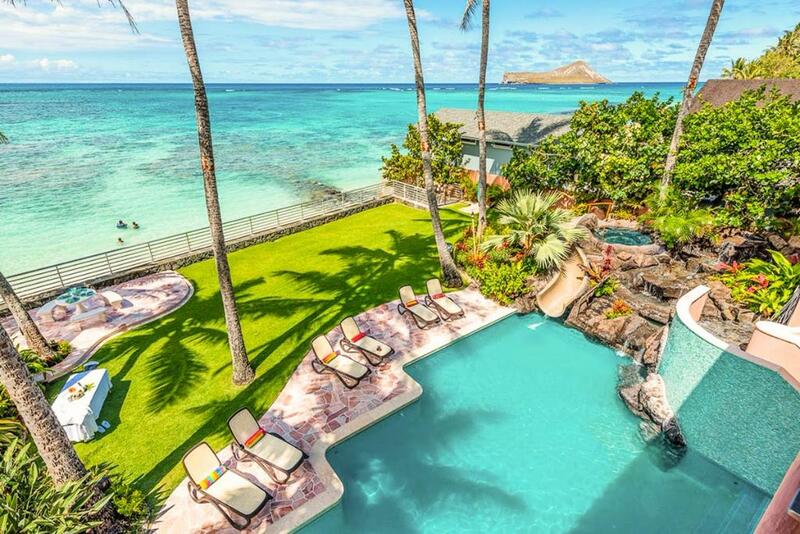 The overall quality of the Oceanfront Pahonu Estate Oahu was amazing. The level of customer service from Ashley Hardy was equal to none. I would come back just to have Ashley. She was very responsive and attentive to all our request and needs. The great room couch was well worn. The air conditioning in the main area of the home did not work. This was very uncomfortable because that is where the majority of the time was spent. The kitchen was unbearable while cooking due to no air. They provided fans for that area but it was not enough. Overall we were satisfied however would not stay again if the air condition in the main area of the home does not work. The amenities were great!!! They left no stone unturned when it came to the toiletries and accessories needed for the home. The best part of the trip was the Estate minus the air condition. There was no need to go anywhere except you want to see the island. Ashley Hardy was so user friendly and attentive the inconveniences seemed minimal. Pahonu Estate was everything I had hoped for and more. It was so spacious it easily accommodated our whole family in style and comfort. We appreciate that you were available for every question/concern we had about the home. I couldn't have asked for better accommodations, or a better agent! Our stay at Pahonu was beyond our expectations! Everyone had a great time. This truly was a once in a lifetime trip. Thanks for helping to arrange it. The Property manager was beyond helpful; answered all our questions and kept us informed about the comings and goings of the repairmen, Thanks so much! If you are looking for a luxury "over-the-top" vacation home, you've found it here in this extraordinary three story estate on the ocean, with secured entrance. This is the personification of comfort, luxury, beauty and enormous space, all on the ocean with gorgeous breezes and views! Beautifully decorated with every convenience, balconies, shaded lanai with bar, BBQ, tables and lounges overlooking a beautiful waterfall pool. Listen to music piped throughout - hit the beaches with your choice of scuba equipment or boogie boards, then return for a workout in the fitness room followed by relaxing in the sauna. You'll be planning your next visit before you even leave! With so much to do so close by, Sea Life Aquarium, golf courses, Waikiki Beach, and so much more, you'll need another trip to get it all in. We give this estate vacation rental 5 star plus! We stayed at this beautiful estate on Oahu for 10 days during Thanksgiving holiday. There were 12 of us and we all had a wonderful time. It's luxurious and spacious, yet very relaxing and with all the amenities of home. The beds are very comfortable and the house was immaculate. The views from all 3 levels are spectacular with the ocean and beach right out the back door and if you don't like salt water there is a very nice pool with a lava rock waterfall. The drive along the coast to Honolulu is also very beautiful with many places to pull off for scenic pictures. Very easy access to shopping and water sports. It's outside the crowded tourist area of Waikiki but located conveniently to all we wanted to see and do. We enjoyed the dolphin shows and Chief's Luau (the best!) at Sea Life Park just a mile or so from the estate, went golfing, boogie-boarding, beach walking and swimming, hiking, a very fun Star Of Honolulu evening dinner cruise, incredible helicopter tour, shopped the strip at Waikiki, Pearl Harbor Tour, and the snorkeling is great right in front of the Estate. For Thanksgiving, we prepared food in the kitchen and on the BBQ and set up a buffet on the outdoor bar and large covered patio by the pool. There are lots of good restaurants in Kailua and Hawaii Kai both just about 10 minutes away. (Assagio's Italian was awesome!). We enjoyed that there's a beach park right next to the estate where local Hawaiian's like to bring their kids for swimming and picnics and some of the local men like to play Ukulele together. It was nice to have the privacy that the private yard and pool area provided at the estate, yet right next to the estate the kids could experience some of the local children and culture at the beach park. (It was pretty cool to see a monument with flower leis draped over it honoring the local Hawaiian fisherman.) David & Patricia are super nice and their rental helpers Mary, Jodie and Ashley went overboard to make sure we understood where everything was, how everything worked and that we had everything we needed. This place is a must for anyone wanting a great get away with no hassle. We will definitely stay here again!! Standing by the ocean wall with my four year old son watching the waves roll in is a memory I will always cherish. Walking through the yard looking at the majesty of the volcanic ridge towering above the house was breathtaking. At night, doors open to the Lanai, the ocean lulls you to sleep or provides the perfect background for a romantic glass of wine by moonlight. The architectural design is the perfect balance of open spaces and private alcoves. While there are endless endeavors to be explored in Hawaii, the estate and beach provide everything that a family needs to have an authentic Hawaiian experience. What a wonderful time! I could not believe the beauty and comfort of this house. Each morning we would drink our coffee on the balcony and look out at the remarkably blue ocean and sky. There were 12 of us, 10 adults and two children. We really enjoyed the large pool and the incredible beach and spent a lot of time under the comfortable covered patio overlooking the pool and ocean. The bedrooms are so comfortable and clean! We cooked our meals in the gourmet kitchen and on the BBQ and ate overlooking the ocean. The home has everything we could want and it's in a great location to relax and enjoy family, but also to get out and get to wherever we wanted to go. Honolulu was about 20 minutes away and Waikiki about 30 minutes. The drive along the coast to get there is breathtaking and made it enjoyable. When we first checked in we received an orientation about where everything was and how everything worked and when we had questions, someone always answered the phone or came over to show us. The property managers provide great customer service and made us feel welcome and comfortable. I liked that all the entertaining is on the 1st and 2nd floors apart from the bedrooms upstairs so those that wanted to go to bed early (me and my husband) weren't disturbed by the ones that wanted to stay up and make noise. We brought the kids to Sea Life Park and had a wonderful time at Chief's Luau, both just a mile or so down the road. The property manager recommended the Star Of Honolulu for a nice dinner cruise with entertainment, and that was also a highlight of the trip. I loved this house and its location! I would recommend it to anyone and I hope one day we can go back again! Thank you so much for a wonderful vacation and memories I'll always cherish!